Registration is now available for Spiritual Formation Program! Please click here to download the registration form. 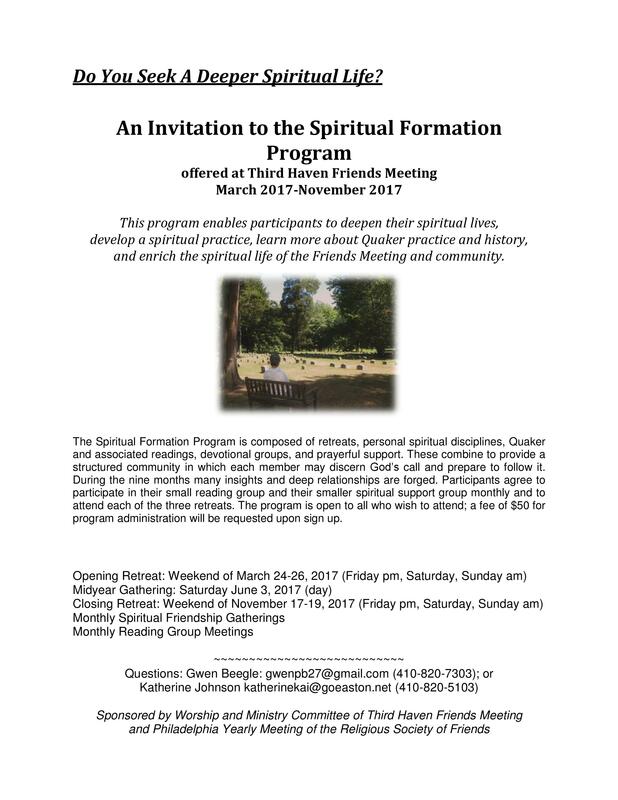 The Spiritual Formation Program is composed of retreats, personal spiritual disciplines, Quaker and associated readings, devotional groups, and prayerful support. These combine to provide a structured community in which each member may discern God’s call and prepare to follow it. During the nine months, many insights and deep relationships are forged. Participants agree to participate in their small reading group and their smaller spiritual support group monthly and to attend each of the three retreats. The program is open to all who wish to attend and is led by Philadelphia Yearly Meeting Facilitators at Third Haven Friends Meeting. Marcelle Martin, Special Guest Speaker: Quaker Teacher and Author of "Our Life is Love, The Quaker Spiritual Journey"
Marcelle Martin is a member of Swarthmore Friends Meeting (PA). Her best-selling book "Our Life is Love" explores the ten essential elements of the Quaker spiritual journey. She has led retreats at Quaker meetings across the country and for four years was the resident Quaker Studies teacher at Pendle Hill, sponsored in part by scholarships provided by Third Haven's Ken Carroll. She is the author of two Pendle Hill pamphlets, Invitation to a Deeper Communion and Holding One Another in the Light. Her blog, "A Whole Heart" is at www.awholeheart.com. Sponsored by Third Haven Worship and Ministry Committee and Philadelphia Yearly Meeting Spiritual Formation Collaborative. This is a special event for all Third Haven Friends. Katherine Johnson: katherinekai@goeaston.net or (410-820-5103).